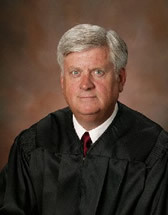 Justice Michael K. Randolph was appointed to the Mississippi Supreme Court by Gov. Haley Barbour on April 23, 2004. Justice Randolph was appointed to serve the unexpired term of former Chief Justice Edwin L. Pittman. Justice Randolph was first elected in November 2004, and re-elected in November 2012, for another eight-year term. He became a Presiding Justice of the Supreme Court on January 1, 2013. He became Chief Justice of the Supreme Court on February 1, 2019. In 2007, he served as Chairman of the Legislatively-created Task Force to Study the Justice Court System. Justice Randolph served as co-chairman of the Task Force for Youth Court Rules of Procedure in 2008. He serves on numerous internal committees of the Court. Justice Randolph was born in 1946. He was decorated for heroism in Vietnam. He served as an air traffic controller with the U.S. Army 1st Infantry Division, known as the Big Red One. He was honorably discharged in 1967. During law school, he received an appointment as a Reserve officer in the United States Navy, Judge Advocate General’s Corps. He is a graduate of the Naval Justice School in Newport, Rhode Island. He was honorably discharged in 1975. He graduated from Rollins College in Winter Park, Fla., with a B.S. degree in business administration in 1972. He earned his Juris Doctorate from the University of Mississippi School of Law in 1974, where he served as president of the Law School Student Body. Justice Randolph began practicing law in 1975, first in Biloxi with the firm of Ross, King and Randolph. Subsequently he practiced with the firm of Bryan, Nelson, Allen and Schroeder in Pascagoula, Biloxi and Gulfport. He opened a Hattiesburg office for Bryan, Nelson, Allen and Schroeder in 1976, where he later formed the firm of Bryan Nelson Randolph, PA., serving as President and CEO until his appointment to the Supreme Court. Justice Randolph holds the highest ranking accorded by Martindale-Hubbell and is listed in their Bar Register of Pre-Eminent Lawyers, as well as A.M. Best's Directory of Recommended Insurance Attorneys and The Insurance Bar. Justice Randolph's legal experience includes extensive state and federal court practice. He primarily devoted his practice to insurance defense for two decades, but in the last decade before appointment to the Supreme Court, his practice was divided equally representing defendants and plaintiffs. He served as regional trial counsel for numerous corporate defendants, as well as national trial counsel for various manufacturing defendants. He has defended physicians, hospitals, nursing homes and home health agencies. He represented numerous insurers in arson and insurance fraud cases. He also had extensive experience in general maritime law and Jones Act cases, primarily representing injured seamen. Justice Randolph was appointed by President Ronald Reagan to serve on the National Coal Council. He has served on the boards of directors of William Carey College, the Boys and Girls Club of Hattiesburg, the Hattiesburg Girls Shelter, and advisory board of the Hattiesburg Salvation Army. He is a former president of the Hattiesburg Civic Association. He was a member of the Hattiesburg Area Development Partnership. He has generously supported Christian Services Inc., United Way, the Salvation Army, Hattiesburg Boys and Girls Club, Mississippi Children's Home Society, Baptist Children's Village, Home of Grace, the University of Mississippi, the University of Southern Mississippi and William Carey University. He is a member of the American Bar Association, the Bar Association of the Fifth Federal Circuit, the Mississippi Bar Association, and the South Central Mississippi Bar Association, which he formerly served as President. Justice Randolph is a member of Temple Baptist Church in Hattiesburg, where he has served as a deacon and Sunday School teacher. He has also served on the Finance Committee and the By-Laws Committee. Justice Randolph is married to Kathy Webb Randolph, formerly of Ocean Springs. He has three children and four grandchildren.